← Rebuilding a home with help of family and friends. 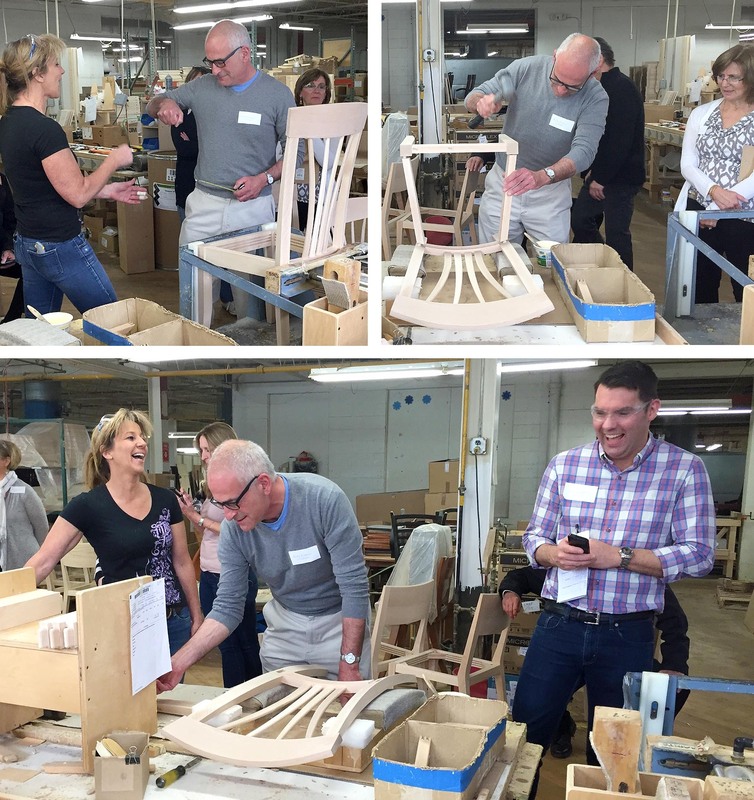 Randy, Chad and Leslie so enjoyed meeting all the talented artisans at Saloom Furniture. Every few years, Saloom invites designers to see new product introductions and to get excited about their innovative designs being brought to market. We caught up with Chad Dutcher, LJE Designer to talk about his recent trip to the Saloom Factory. Randy attempts building a chair at Saloom, while Chad laughs on. Pam Morais helps him with his technique. 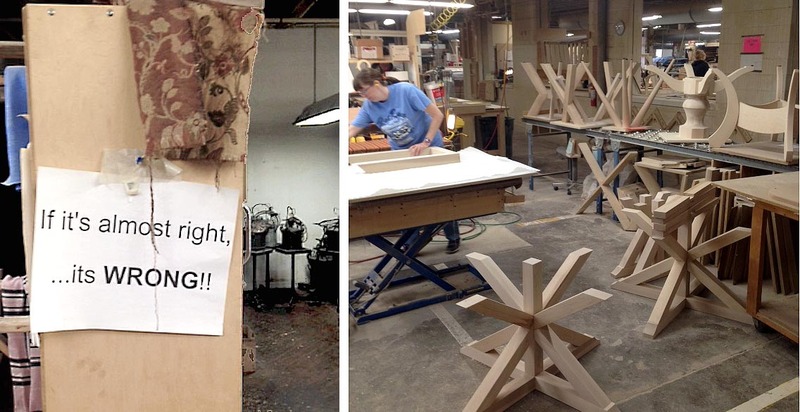 A little furniture factory humor sets the tone for workers to maintain highest of standards. Left: Cona Dining Table pairs sharp cone-shaped legs with a soft, rounded rectangular top. It is made to order entirely out of solid maple, and comes in a wide range of sizes and rich finishes to fit into and complement any dining space. 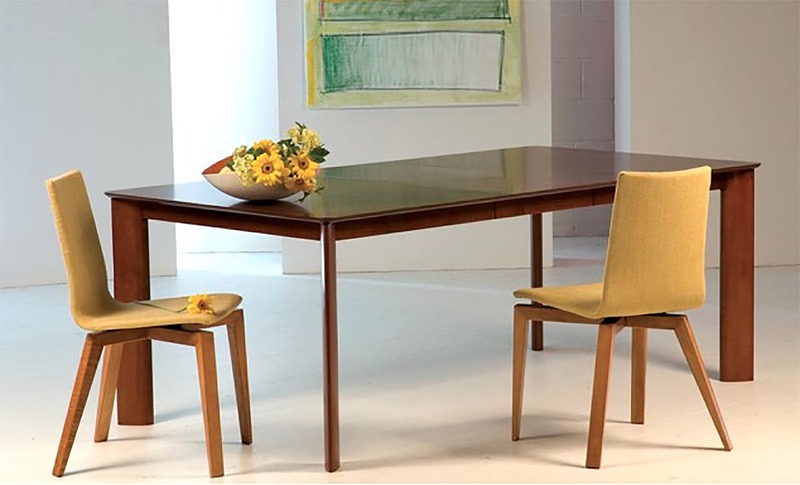 Right: The Ella Round Dining Table offers a new take on mid-century modern design. The arc of the four tapered legs meets at the center of the round top, and complements its curves. The bow-legged stance of the base is at once elegant and playful. Why we love Saloom? Our designers can work closely with clients to create a custom one of a kind piece of furniture. You dream it, They create it! Aura Design by Peter Francis, 2010.Made in Massachusetts by Saloom Furniture. 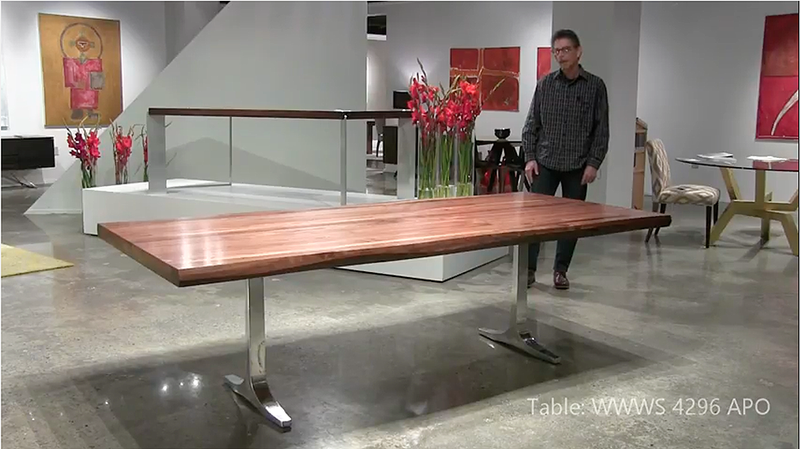 The Aura Dining Table combines the distinctly modern look of glass with the warmth of solid maple. and this is how the furniture magic happens…..
Visit our showroom to experience all the choices. Pick your style, shape, size, color and texture…..edge choice, pedestal base, and mix and match your tabletops. And kid proofing: An applied high performance top coat that will protect your piece for many years. Part of the Skyline Collection by Saloom called Ari. The Slip chair appears to float through the air and is designed to flex for comfort. It is executed with simple lines and an ergonomically friendly laminated plyshell bucket that sits on a chair base. Available in all wood or with an upholstered plyshell bucket. 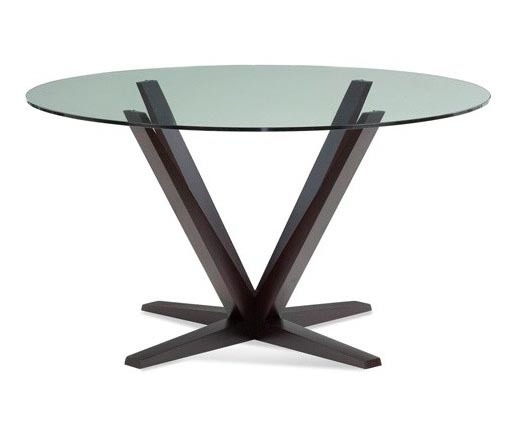 A modern Saloom pedestal dining table with an architectural base. 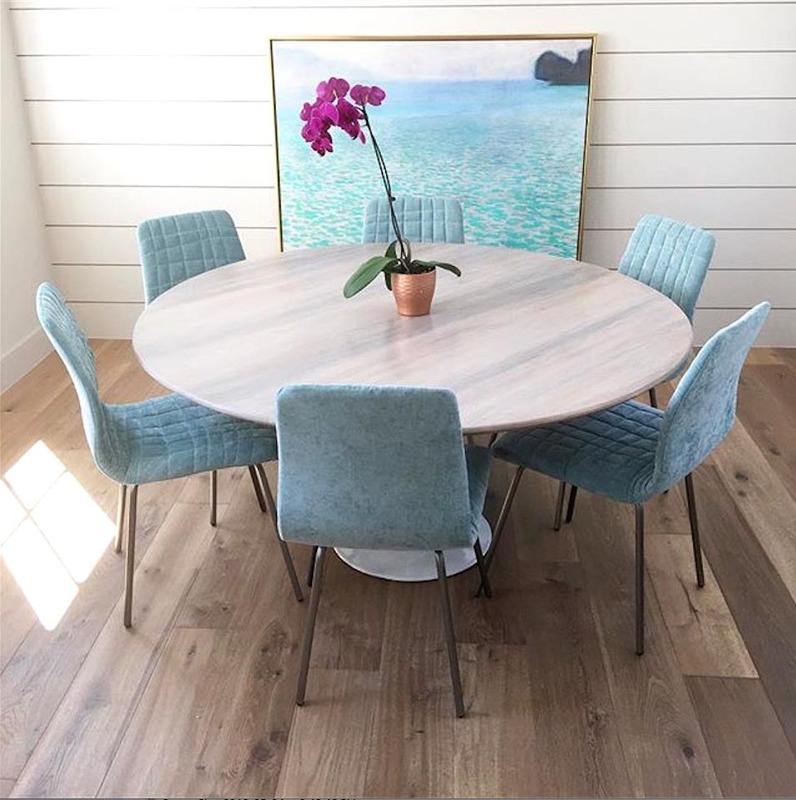 “Sleek cowskin chairs add style to the dining area.” credits Beth Rosenfield Design. The dining table is the heart of your home, a piece that important should be designed by you to fit your style, If you intend to shop for one you’ll have forever, it needs to be well crafted and strong. A huge variety of STYLES include contemporary, transitional, and country. Also accompanied by a large collections of fabrics including the popular all-weather brand – SUNBRELLA. 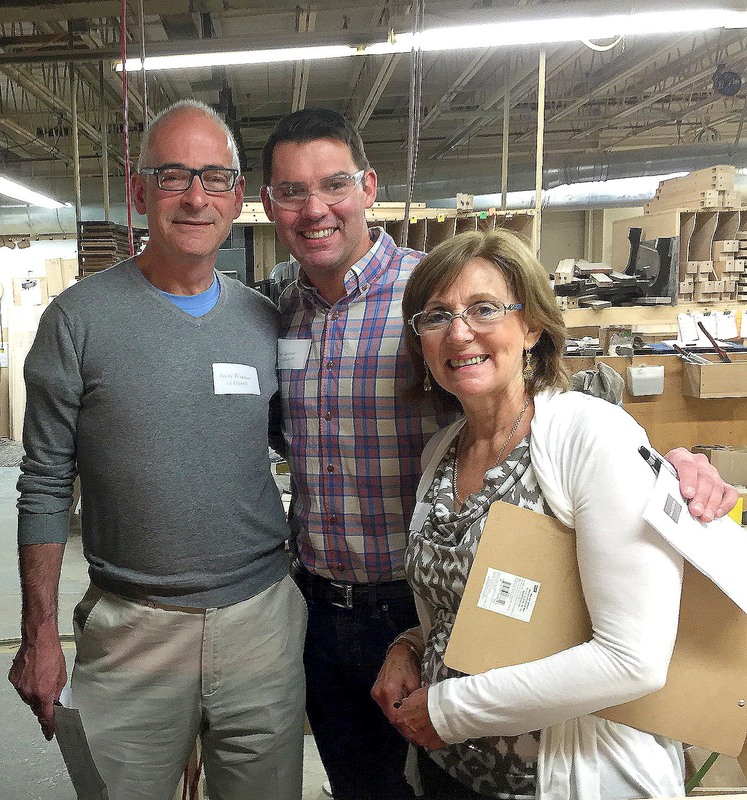 “Linda and I feel fortunate to live and work in Massachusetts which has a rich furniture manufacturing history. 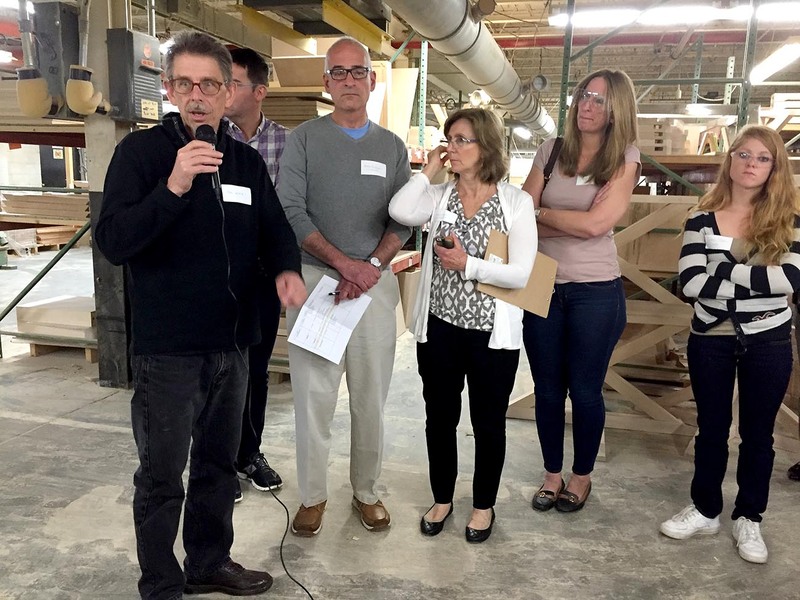 All of our furniture is hand crafted by our New England artisans, who take pride in their work and in building a dining set made just for you.” says Peter Saloom. 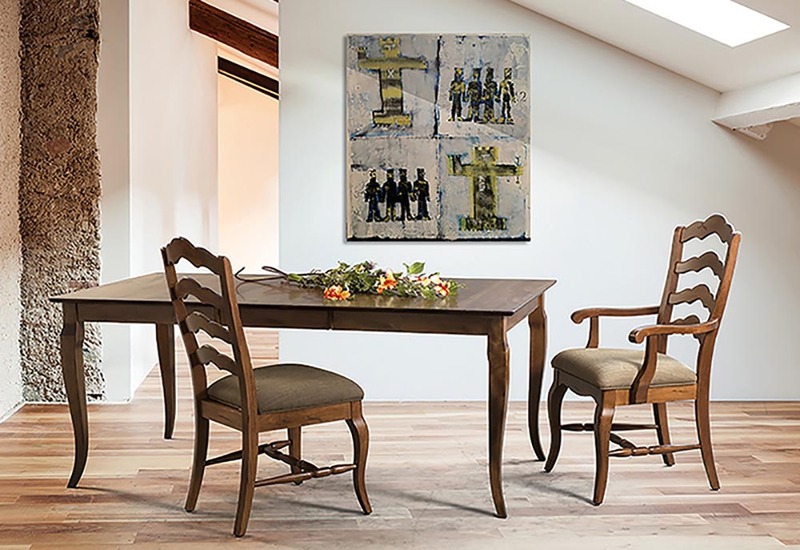 Contemporary style of the Saloom Furniture Web 111 Dining Chair. It features a flexible yet supportive molded plyshell bucket seat, which is made even more comfortable with soft upholstery. Hand stitching of the upholstery results in a distinctive web-like pattern. The soft curved seat is counterbalanced by minimalist steel tube legs. And that means pretty much any style–from curvaceous and traditional to streamlined and modern, as well as most points in-between (including country, mid century and rustic modern). They are all hand made by skilled crafts-people, using only locally sourced hardwoods and time-tested manufacturing techniques. And are guaranteed to last. New products are shown at the 2016 Highpoint Show: This is the Apollo Table with a solid walnut top, 96″ x 42″ with a sculpted edge. Saloom maintains a striking a balance between yesterday’s values and today’s best and brightest ideas. Proudly made in America using eco-friendly practices. That’s why we love Saloom…..good collaboration, makes for happy customers! This entry was posted in Uncategorized and tagged special offer. Bookmark the permalink.